Summer is, without a doubt, my favorite season. What is it not to like about summer? The sun is out, days are longer, and weekends are usually packed with all sorts of events whether it is impromptu pic-nics in the park, BBQ’s, drinks by the river, bike rides, ice-creams… Plus if we are lucky to get tickets …what about attending a tennis tournament in Wimbledon, the races at Ascot or the regatta at Henley? The St.Tropez was born out of the need of having a pair of shoes that you can wear to any of the above events and to look your best without compromising on comfort or style. 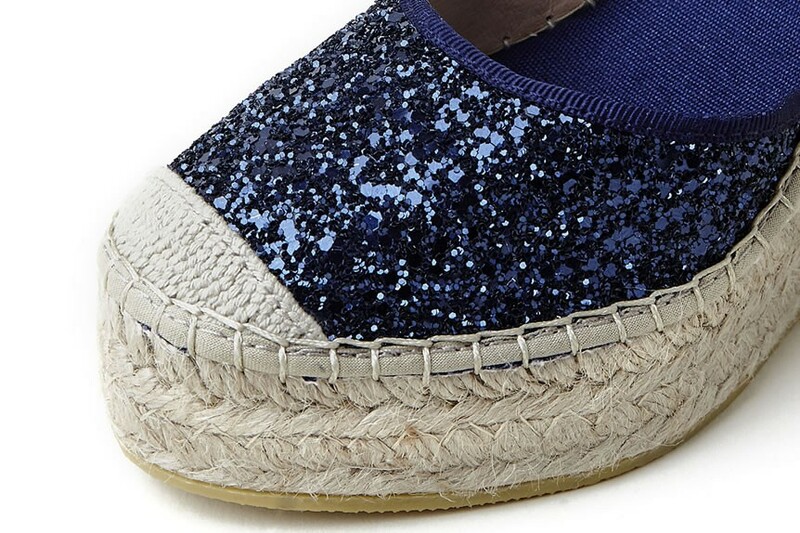 The starting point was a classic navy blue espadrille with a comfortable wedge, easy to match with all your outfits.Then came the modern twist, a fabric made of glitter that adds a different, unique and modern touch to it. I was also keen on having a belt around the ankle to allow you to walk safely and in comfort. This versatile pair of shoes can be taken in your next holiday and worn at all times -saving you the need of packing lots of pairs of shoes-with shorts in the morning, white jeans in the afternoon and a maxi dress in the evening. The St.Tropez comes in a limited edition so don’t wait too long to order yours!